Historically, the muscle gene therapy field has been primarily focused on replacing defective or missing genes underlying recessive disorders and has matured to the point where several gene replacement strategies have now been tested or are underway in human clinical trials. Unfortunately, gene replacement strategies are not indicated for treating dominant diseases, where reduction or elimination of an abnormal allele would be needed, and as a result, gene therapies for dominant muscular dystrophies have lagged behind. Importantly, the emergence of RNA interference (RNAi) as a gene-silencing tool provided a means to begin closing this development gap. 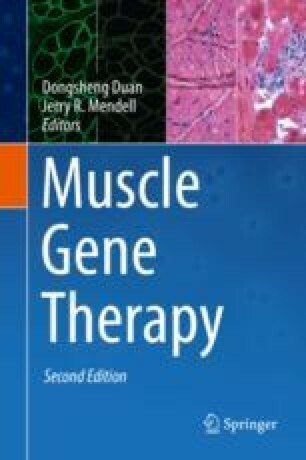 In the first edition of this chapter of Muscle Gene Therapy, we discussed the prospects of combining RNAi and gene therapy to treat dominant muscle diseases, but proof of concept for its practical usage had not been demonstrated at the time. Here, in this second edition, we update our current understanding of the mechanisms underlying RNAi, compile several preclinical examples of RNAi-based gene therapies for muscle diseases, and discuss current prospects for translating these strategies toward the clinic.